Kolkata has been a London of the East for years. Being an erstwhile capital of British India, Kolkata has multiple similarities to London. With tea, tram, the Victoria Memorial, Gothic architecture, the wax museum, the replica of Big Ben and the Eco Park resembling London’s Hyde Park, Kolkata is no less than the capital of Britain. With the newly opened floating market, the City of Joy has turned over a new leaf. The floating market in Kolkata likens the city to Venice or Thailand. Located at Patuli on the Eastern Metropolitan Bypass, the floating market in Kolkata is a brand new tourist place for inbound travelers. Initially, 114 boats are anchored in an order on a sprawling lake, and as many as 228 shopkeepers are offering their fresh merchandise of fruits, vegetables, flowers and other daily commodities. There will be 150 boats, at least, in the near future. 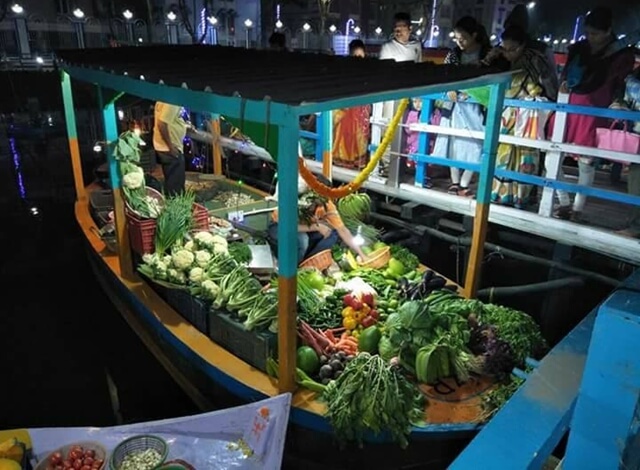 Kolkata’s first market on water operates from 6 PM to 9 PM in the evening. It has wooden walkways for buyers and visitors to reach the boats at a distance from the shore. The floating market in Kolkata may not be as beautiful as Kashmir’s Dal Lake market, but it has its own beauty which glitters after the sun sets. The lake has been beautified with lively sculptures on the shore. Actually, the floating market in Kolkata is a rehabilitation project for the welfare of the shopkeepers who were evacuated to facilitate a major extension of the Eastern Metropolitan Bypass. 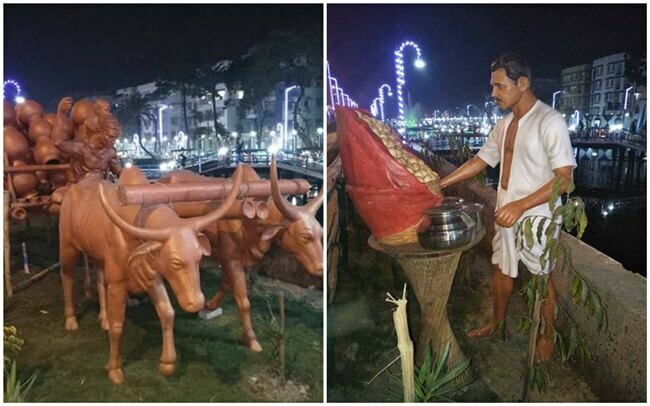 West Bengal’s Chief Minister Mamata Banerjee came up with the project based on her idea borrowed from Bangkok and got it executed at a cost of INR 9 crore. The market operates under the Kolkata Metropolitan Development Authority. The locals have already started comparing the city to Bangkok and Venice. The floating market is not just a rehabilitation project but one of the places to visit in Kolkata. It will surely be among the best places for photography in Kolkata. Furthermore, the city boasts Seven Wonders of the World in the Eco Park.